When I went to work yesterday I was wondering what I should write about in this weekly update and now one day later there is a full update with exciting stories from three different continents! Thank you so much for sharing your stories. It’s amazing week on week to see all your energy and hard work. This week will take us to South Africa, China and the United States of America so let’s get moving. Thursday the CCD Johannesburg Steering Committee was attending the Provincial NCD prevention and control quarterly meeting to present their CCD research from 2016. The Public Health department in the Gauteng province, South Africa has initiated these meetings to address the prevalence and complications of common NCDs that are leading causes of mortality in the region. At the meeting the Premier’s office shared a research report on the burden of lifestyle diseases in Gauteng. The meeting was attended by various government departments within sports and recreation, health promotion sectors, NCD department as well as other pharmaceutical companies and academia. The meetings will take place quarterly to plan, coordinate and implement strategies that will reduce the burden of Non Communicable Diseases in the province. This is a great way of sharing local findings and integrating them into the national health political dialogue. Thank you very much Babalwa for sharing this story. On 16 June 2018, the Royal Danish Embassy together with Novo Nordisk hosted the 2nd meeting of Danish Health Network in Beijing office of Novo Nordisk China. Dr. Kristian Teglkamp, the counsellor/head of Health and life sciences of the Royal Danish Embassy and Ms. Liu Yingzhi, the Public Affairs Associate Director, welcomed all participants from other companies such as ALK, Coloplast, Oticon, Radiometer. Dr. Tong Yu, Senior Medical Affairs Director gave a short diabetes course on the disease awareness. Ms. Xie Yuan, Market Access Strategy Director, from the perspective of Novo Nordisk, made a very comprehensive and in depth analysis on the healthcare key initiatives in the 13th five year plan. Yingzhi introduced the Cities Changing Diabetes Program to all participants. Novo Nordisk, as the leader of Changing Diabetes, would like to raise the awareness of the whole society to bend the curve on diabetes. Yingzhi underlined that all relevant stakeholders including policy makers, healthcare institutions and individuals should take responsibility for improving public health. All the participants were very impressed by the presentations and some of the participants showed interests in future collaboration in CCD program. Thank you very much Yingzhi for sharing this great update. 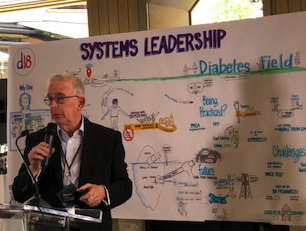 Wednesday this week Dr. Alan Moses presented the “bending the curve data” at D18 Executive Innovation Lab in Diabetes and Prediabetes in Aspen Colorado. D18 in short is an annual event hosted by Kelly Close and her non-profit organization Diatribe where they are gathering key thinkers within the diabetes healthcare space. In a session focused on scenario planning the presentation was used as an example of what diabetes might look like in 2045 if nothing is done to address the challenge of obesity. It appeared to have been a successful exercise and led to a productive break out session after lunch where three scenarios were developed by different working groups: 1) status quo; 2) collapse; and 3) transformational. I would love to hear what came out of this working session once the work has been synthesized. Later the same day Dr. Faith Foreman from the Houston Health Department presented CCD in Houston. She had the opportunity to present the work they have been doing in Houston over the last four years. I heard from one of the participants that CCD as a programme was very well received and it has appeal. We are normally used to explain the ‘why’ but that was not the case at D18. I hope the participants were inspired by both presentations and I hope that they will go home and start working on healthier cities. Thank you very much Alan and Klaus for sharing your experiences at D18. Do you follow CCD on social media? We encourage you to join the conversation about #UrbanDiabetes. See what our CCD partners are up to around the globe or get inspired by urban thinkers out there – just follow @CitiesDiabetes on Twitterand Facebook. This is it for this week. Thank you very much all of you working to bend the diabetes curve out there. Please continue to share your stories, they are appreciated by many people all over the world. Have a great weekend when you get there.